Size of Male: 65-80 lbs., 22.5-25 in. Size of Female: 50-65 lbs., 21-23.5 in. Visit our Boxer dog names page. and lively nature, this breed makes a perfect addition to the family. Although they have a certain pride about them, they are not arrogant. 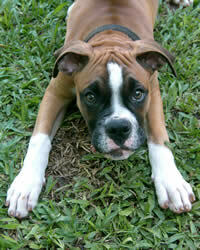 Boxer dogs originated in Germany, where they were bred as fighting dogs. Their lineage can be traced to two European breeds that no longer exist; the Danziger bullenbaiser and the Brabenter bullenbaiser. In the 1830s, German hunters began to cross bullenbaisers with mastiff-type breeds which led to the eventual establishment of the Boxer breed in about 1895. Sometime after 1900 Boxer dogs were officially recognized by the AKC, and today this breed is very popular as a family, utility and a show dog. Boxer dogs are highly inquisitive and very devoted. Their playful and loyal nature makes them perfect family and utility dogs. They have a very dignified aura about them and are very good with children and other family pets. They can, however, be aggressive towards unfamiliar dogs, so walking them with a leash is always recommended. Playful and always full of energy, these dogs crave attention, so be prepared to give plenty of it. They are also fearless dogs and very courageous, making them very good watchdogs. healthy, they should be indulged in lots of outdoor activities. health issues and their associated symptoms so you can spot them if your dog begins showing symptoms. assertive due to their very strong personality. Boxer dogs can be very headstrong, so training can be a challenge. you are the leader and not the other way around. Early training is very important as it becomes much more difficult with an older dog.